Benjamin Towne’s Pennsylvania Evening Post was the first newspaper to print the Declaration of Independence. Towne’s Saturday, July 6, publication was preceded only by the broadside that went to John Dunlap’s press on July 4 (published on July 5), and beat Dunlap’s own newspaper, The Pennsylvania Packet, by two days. Towne was thus the second person to print the Declaration in any form, and, while the words are the same, his typesetting is markedly different from that of the official Dunlap version. Because they preserve the text of the Declaration as first written and read, July 1776 printings like this are, in a way, even more original than the “original” engrossed manuscript, the prized treasure in the National Archives. When most Americans picture the Declaration, they envision the manuscript signed by John Hancock and 55 others, and titled “The unanimous Declaration of the thirteen united States of America.” But this is not an image of the document that was penned and signed on July 4, 1776. The Declaration could not have been given that title when it passed: the vote was one shy of the desired unanimity because New York’s delegates followed their state’s specific instructions and abstained. As seen in this newspaper, on July 4 the document was titled “A Declaration by the Representatives of the United States of America, in General Congress assembled” and was signed only by Continental Congress President John Hancock and Secretary Charles Thomson. The Pennsylvania Evening Post was distributed far and wide, even by members of the Continental Congress. “I have this Moment folded up a Magazine, and an Evening Post,” John Adams wrote to Abigail on July 7, “and sent it off, by an Express, who could not wait for me to write a single Line.” As witnessed by Adams, this rare paper reflects the experience of everyday Americans as they read news of independence for the first time during that momentous July of 1776. Declaration issues of The Pennsylvania Evening Post are rare. Our census (page 19) locates sixteen institutional and three privately held copies, including this lot. Our search of major auction records finds only six sales in a little over 100 years. Excluding second appearances, this is one of only four copies we have found recorded on the market. On June 7, 1776, Richard Henry Lee, a Virginia delegate to the Second Continental Congress, proposed a resolution calling for American independence. The Congress appointed a Committee of Five—John Adams, Roger Sherman, Benjamin Franklin, Robert Livingston, and Thomas Jefferson—to draft an appropriate message. Written by Jefferson, with minor edits by Franklin and Adams, the draft was submitted to Congress on June 28. “The Second Day of July 1776, will be the most memorable Epocha, in the History of America. I am apt to believe that it will be celebrated, by succeeding Generations, as the great anniversary Festival. It ought to be commemorated, as the Day of Deliverance by solemn Acts of Devotion to God Almighty. In the two days following the resolution of independence, Congress continued to struggle with the wording of the final Declaration. Though some revisions were made (in particular, striking the provision calling for abolition of the slave trade), it remained essentially Jefferson’s prose. On Thursday, July 4, the delegates of 12 of the 13 states agreed to the final text of the Declaration, pledging “to each other our lives, our fortunes, and our sacred honor” to uphold its principles. The approved manuscript, now lost, was signed by Continental Congress President John Hancock and Secretary Charles Thomson. It was then taken to printer John Dunlap, presumably by a member of the Committee of Five that had been ordered to supervise its publication. Dunlap delivered the freshly-printed copies of his official broadsides to Congress on the morning of July 5. Over the next few days, Hancock sent them to the thirteen former colonies—now states—to General George Washington and other military commanders, as well as to the British government. Benjamin Towne (ca. 1740-1793) of Lincolnshire, England, arrived in Philadelphia in 1769. He joined The Pennsylvania Chronicle, a loyal Whig newspaper, but quit after his backers pulled out upon his publication of patriot John Dickinson’s Letters from a Farmer in Pennsylvania. On January 24, 1775, he began publishing The Pennsylvania Evening Post, the fourth English newspaper in the city, its first tri-weekly paper, and the only evening newspaper. Politically, Towne was clearly a pragmatist. He espoused patriot ideals when he opened his Philadelphia print shop, but when the British occupied the city on September 26, 1776, he became a Royalist in time for his next publication. When the British evacuated the city seven months later, Towne reverted to the patriot banner. In 1778, when the city’s military fortunes again shifted, Towne began publishing The Royal Pennsylvania Gazette, lasting only 25 issues. As the other newspapers either evacuated or suspended publication, Towne’s fluid sense of loyalty allowed him to remain the sole newspaper publisher in Philadelphia. Nonetheless, his opportunism marked him as disloyal, and he was “attainted” for treason in 1778, although the charges were later dropped. Towne, in addition to printing America’s founding document, was intimately involved in publishing other important Revolutionary-era documents, and generated controversy in doing so. Towne’s Pennsylvania Evening Post was the first newspaper to print the Virginia Declaration of Rights on June 6, 1776. His newspaper also printed Thomas Paine’s American Crisis that December. Towne was at the center of Paine’s disagreement with original Common Sense publisher Robert Bell. After Bell reprinted an unauthorized edition of Common Sense, Paine jettisoned his original publisher and instead engaged William and Thomas Bradford to re-publish the pamphlet. The Bradfords contracted with Styner & Cist (publishers of The Pennsylvania Journal) and with Towne to each print 3,000 copies. Moreover, the acrimony between Bell and the Bradford brothers is well documented in the dueling advertisements and editorial comments found in Towne’s newspaper. On May 30, 1783, Towne turned the Pennsylvania Evening Post into the first daily newspaper in the United States. However, with Towne branded a traitor and forced to hawk his own papers on the street, the newspaper collapsed the following year. John Dunlap and David Claypoole then made their Pennsylvania Packet the first successful daily on September 21, 1784. In our research into the publication of all of the July 1776 Declaration broadsides and newspapers, we have discovered something significant about the first two printings. A close comparison of The Pennsylvania Evening Post to John Dunlap’s broadside (a single-page, printed document created to disseminate news by being read, shared, and posted) reveals a series of typesetting differences, particularly in the use of capitalization, too numerous to be coincidental. Both versions capitalize the beginning of sentences, proper names, and words such as “God,” “King,” “Prince,” etc., but excluding those, Dunlap capitalizes an additional 291 internal words (within sentences). However, Towne capitalizes only two internal words. This observation led us to compare two June 1776 working drafts of the Declaration, one in Thomas Jefferson’s hand, and one copied from Jefferson’s draft by John Adams. The Adams copy follows the same pattern, with Adams capitalizing many words that Jefferson has in lower case. We have seen hundreds of Jefferson letters and manuscripts, many of which show his distinctive habit of lower-casing words, even at the beginning of sentences. John Adams’s letters and documents reveal the opposite tendency; many of Adams’s lower-case letters look like capitals, and he often used capitalization for effect beyond grammatical necessity. From these comparisons, we observe that The Pennsylvania Evening Post printing of the Declaration follows Jefferson’s handwriting and capitalization style, and that the Dunlap broadside conforms to Adams’s style. A comparison of these documents is provided on pages 12 and 13. We looked for any meaningful differences in phrasing, spelling or punctuation. We did find a few spelling anomalies and capitalization inconsistencies. 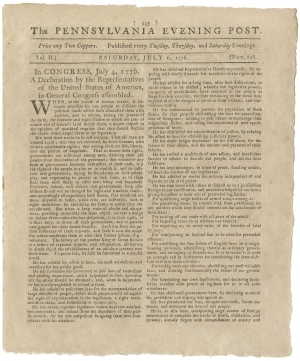 In the entire text of the Declaration, as published in The Pennsylvania Evening Post, Towne spells three words (and one plural form) differently than Jefferson, Adams and Dunlap: “intitle,” “connexion” (and “connexions”), and “Independant.” Performing a key word search of every other 1776 issue of the Post available on the Early American Newspapers database, we see that Towne spells “intitle” 4 times and “entitle” 3 times; “connexion” and “connexions” 21 times, and “connection” and “connections” 2 times; “Independant” is found 30 times, and “independent” 8 times. It is reasonable to conclude that spelling differences between the Post and the other versions can be explained by Towne’s preferences, or at least a normal degree of variation in spelling those words. These typesetting differences allow us to track the Declaration’s dissemination throughout the states. From this, we see that Towne’s newspaper was sometimes the first to arrive with the momentous news—spreading the word of independence to places far beyond his Philadelphia locale. For example, Ezekiel Russell’s four-column Salem broadside (shown here) was the first publication of the Declaration in Massachusetts. It closely follows the Post’s style. But soon after, Russell was given a Dunlap with the order to publish the Official Massachusetts printing. His slightly later official version closely follows the style found in the Dunlap broadside. As news of the Declaration swept throughout the former colonies and officials held public readings of the document, Americans celebrated with “huzzahs,” 13-gun salutes, toasts, parades, and sometimes boisterous mobs that tore down and burned local symbols of British authority. In Boston, jubilant crowds toppled the lion and unicorn carvings that graced the gabled ends of the Massachusetts Town House (now known as the Old State House), the seat of the Royal government. In Philadelphia, the militia tore down and burned George III’s coat of arms. The most famous scene occurred in New York City: After George Washington had the Declaration read to the American Army on July 9, a mob toppled the lead statue of George III in Bowling Green. The King and his horse were then transported to Connecticut, melted down, and cast into 42,088 musket balls for the Patriots’ cause. On August 2, 1776, members of Congress met and signed the engrossed copy of the Declaration. According to the National Archives, a few of the signers added their names at later dates: George Wythe on August 27; Richard Henry Lee, Elbridge Gerry, and Oliver Wolcott on September 4; Matthew Thornton on November 19; and Thomas McKean, the last signer, in 1781. Of the 56 signers, only 39 had actually voted for independence. Eight were newly-elected members who joined Congress after July 4. George Read of Delaware had opposed independence, but signed the Declaration anyway. And some members who voted for independence never had an opportunity to sign the actual Declaration—Henry Wisner, for instance, who returned instead to New York’s assembly, and New Jersey’s Robert R. Livingston, one of the Committee of Five appointed to draft the document. The names of the men who had risked their lives by signing were first revealed in January of 1777, when, by order of Congress, Mary Goddard printed a new broadside of the Declaration to be sent to all the states. The engrossed Declaration manuscript did not become a familiar image until patriotic fervor following the War of 1812 led to renewed interest in America’s founding. At the time of independence, most Americans received their news in printed newspapers or broadsides, and the first newspaper to publish the Declaration was Towne’s July 6th Post.